Iga-ryu Ninjutsu was skilled in magic. Though Iga was comparatively close to the capital, it hosted many exiles on account of its being situated in a basin surrounded by mountains. Among those exiles, there was a clan descendant from Mononobe Uji, as well as peoples who had crossed over, who were skilled in magic and illusions. A representative magic is the art of “Kuji Goshinbo” (nine characters self-protection). Have you seen a ninja making these hand signs in an old ninja movie? Mainly, there is the method of making a sign with both hands, with the right index and middle fingers raised to signify a sword, while reciting the nine characters. Inmei Goshinbo - Five types of signs were made, including “Josango” and “Renge’in”, while reciting magic spells. Juji no Hijutsu - Write ten characters, including “heaven”, “dragon”, and “tiger” on the palm of the hand, and drink and squeeze. Both of these encouraged mental uniformity, and gave an intense self-suggestion of “being okay”. One other skill that Iga ninja excelled in was the use of fire. In movies and comic books, have you seen a ninja who has run into trouble explode a smoke bomb and disappear (escape) with the smoke? This sort of skill was actually the one most well-used by the Iga ninja. Besides smoke bombs, ninja also employed flaming arrows, signal fires, threw flaming arrows, and even used guns. In a time where there were no missiles, there was surely great fear and damage caused by attacking with fire. This appears to have also developed as a result of having the materials to build explosives nearby, and because people with skills in explosives were in abundance. The art of mixing explosives was a secret among secrets in the tradition of ninjutsu. Ninja espionage is primarily composed of intelligence gathering and message transmission. To do so, a ninja has skills to walk quietly enough to be able to sneak into places, as well as to transmit information quickly. Here are five representative skills for walking. Each has a different use depending on the situation, but “Kitsune-bashiri” (fox running) and “Shinso Usagi-aruki” (deep grass rabbit walking) both appear to have made no sound. Running skills were for rapidly transmitting information. Ninja were also called “people with fast feet” for their famed speed. For example, the ninja Idaten is said to have been able to run 200km in a single day. Running fast is possible mainly through training, but there were also secret skills and information for doing so. Breathing method called “dual breathing”: Breath in a repeated rhythm of “inhale - exhale - exhale - inhale - exhale - inhale - inhale - exhale”. Doing so increases the oxygen ingested, and helps a person to focus and run without thinking of other things. Further, it is important to look far ahead when running. This is to keep the chin down. When the chin goes up, breathing is said to be disturbed. There is also the method of placing a pickled plum in one’s navel. This is probably a way of self-suggesting that “I can run fast”. Why not try either of these in a marathon race? Ninja must weigh 60kg or less! When people imagine ninja, they often think of “running fast”, or “ability to fight”, or “powerful”, so there is a rather muscular, large image. However, if you think about the following, that mage might change somewhat. Ninja performed espionage in attics and under floors, made deft movements, and practiced camouflage, among other things. These would be tough to do with a large body, wouldn’t they? Because of their work on roofs, ninja had to constantly have tempered fingers. To train, they are said to have used bales of rice. These bales weighed about 60kg. In other words, to be able to lift 60kg in training is to be able to lift oneself, including hanging from ceilings. Another thing is that if his name is any indication, Shotoku Taishi’s right hand man Otomono Sahito was probably slim, giving ninja that characteristic. This is because “Sahito” literally means “slim person”. Ninja were geniuses of camouflage! When not working, ninja lived the same lives as farmers. When they went about their work, they used to camouflage, so as not to be revealed as ninja to those around them. When they traveled along roads, they changed their appearance from that of commoners and farmers to medicine peddlers or mountain monks, changing between clothing that suited the situation. In traditional Ninja writings, there was a camouflage method known as Shichihoude, which was divided into the seven types of nihilist monk, priest, mountain monk, merchant, minstrel, and performer. What, then, was a ninja’s outfit? Actually, it was a mask used by farmers in the Iga region, and was worn when working at night. This clothing allowed one to blend into the night. The most famous of the ninja weapons is the shuriken (ninja star), but ninja are said not to have carried it so often. This is because possession of one would give away one’s identity as a ninja if they were stopped for identification and inspection along the way. Therefore, weapons which could be carried without causing suspicion - farm implements - were used by ninja. There are several others as well. Because ninjutsu is not a martial art, fighting against an enemy is a last resort, and the shuriken (ninja star) weapon was one method of that self-defense. Since the job of a ninja was to bring back information, there are many skills for escaping. The shuriken, a representative ninja weapon, includes both flat and cylindrical varieties. Being of various shapes, there are types with four, five, six, seven, or eight sides. Also, the tip of a sword is short and thus it cannot inflict a fatal wound, but its power to kill could be enhanced in such ways as placing poison on the tip. There were also others, such as placing a slow match on a flat shuriken to throw at the enemy, metal cones for putting with flat shuriken to throw, or to hold in one’s hand and wound the enemy. However, if one walked about with these, they would look suspicious, so ninja often used pegs and sewing needles for the same purposes. Using these to shoot from the cracks of doors, etc., this was an optimal weapon for a ninja who wished to hide himself. Blow darts were normally used for hunting and other purposes, but since the long tubes would arouse suspicion, they used blow tubes as flutes, etc. to avoid detection. Besides using these for sewing fabric, ninja also heated needles in fire and floated them on water to magnetize them, or used them as weapons such as darts, and even used them for medical self-treatment. Needles were thus used in a wide variety of ways. And since they could be held without arousing suspicion, needles could be said to be the most useful of all tools to the ninja. For health, ninja avoided meat, fish, dairy foods, and sugars in favor of a diet centered on whole-grain rice and vegetables. Also, to avoid being detected when sneaking or hiding, they avoided foods that might lead to body odor. However, they did not avoid these foods completely, but seem to have eaten some foods for strength as well. Mushrooms, mulberries, oleaster, chestnuts, sweet chestnuts, nutmeg, and pine nuts. There are portable foods from this time such as dried rice, but there were also portable foods particular to the ninja. This was made from crushed plum pulp, put with rye ergot (a fungus that grew on grass) and crystallized sugar, and made into a ball. This was made with carrots, buckwheat flour, wheat flour, yam, licorice root, and rice flour which was steeped in sake for three years. When the sake had dried, the mixture was balled in about the size of a peach pit and ready for use. These were matched with characters: color, blue, yellow, red, white, black, purple. One explanation holds that these characters were used even prior to the bringing of Chinese characters to Japan, and they appear squiggly like a snake. Ninja clothing was made to be light and prevent the wearer from being noticed. 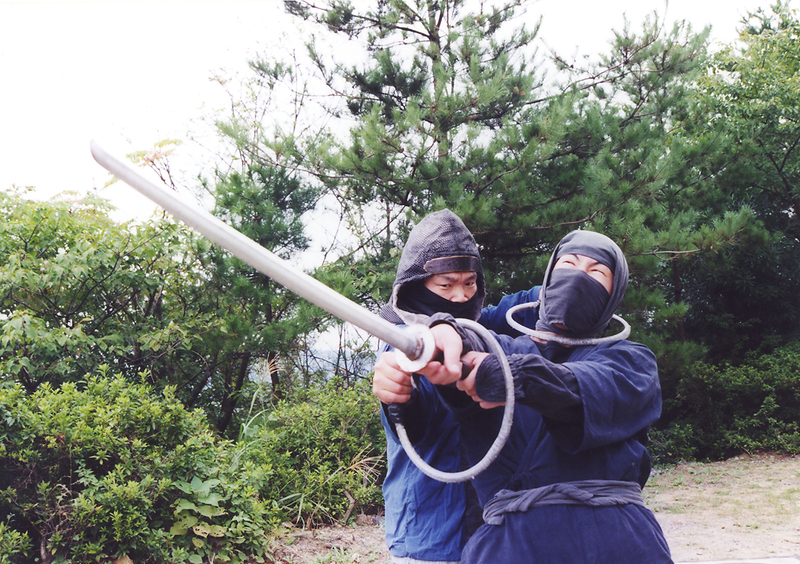 Black ninja clothing is often seen in movies, but there was actually no jet-black clothing. Jet-black would cause the form to stand out in the light of the moon, so a dark navy blue dying method was usually used. This navy blue dye fulfilled a function of being a sort of viper pattern, much like the rattlesnake-like pattern in the color of jeans.